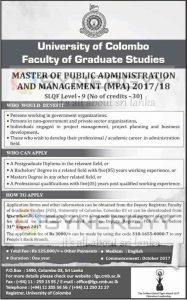 University of Colombo Faculty of Graduate Studies invites applications for the Master of Public Administration and Management (MPA) for the academic year of 2017/18. The Master of Public Administration and Management (MPA) equivalent to SLQF Level – 9 with credits – 30. Persons working in government organizations. Persons in non-government and private sector organizations. Individuals engaged in project management, project planning and business development. Those who wish to develop their professional / academic career in administration field. A Professional qualifications with five(05) years post qualified working experience. Application forms and other information can be obtained from the Deputy Registrar, Faculty of Graduate Studies (FGS), University of Colombo, Colombo 03 or can be downloaded from www.fgs,cmb,ac,lk. Completed application form along with the receipt of payment of application fee should be sent under registered post to Deputy Registrar FGS on or before 31st August 2017. The application fee of Rs 3000/= can be made by using the code 318-1655-0000-7 to any People’s Bank Branch.